The Coated Paper Group provides pressure sensitive and heat seal coated products to the medical, industrial, and label markets. We will work with you to design and develop specialty coated products to meet your requirements. We have the ability to custom coat a wide variety of substrates using solvent, waterbase, and hot melt adhesive technologies. Our converting capabilities include slitting, sheeting, and die cutting. We will work with you to design and develop specialty coated products to meet your requirements. For the medical market, we coat foams, both urethane and polyethylene, films including urethane, polyester and polyethylene, as well as woven and nonwoven fabrics. Typical uses for our products include consumer bandages, IV bandages, grounding pads, and ECG pads. 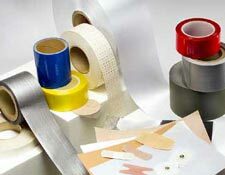 Our industrial products include specialty single and double faced tapes as well as custom coated fabrics, films, foils, and papers for a variety of end uses including woven polyethylene repair tapes in different sizes and colors, carpet tile installation tape, bulk bag assembly tapes, and embroidery backing tapes. We have the ability to apply pressure sensitive or heat seal adhesives to your substrate and convert it to rolls or sheets. The Coated Paper Group manufactures both fabric and paper heat seal labels for the furniture and carpet industries. We also produce pattern coated pressure sensitive and heat seal labels for specialty applications such as stamp wraps, Cheshire mailing labels, sterilization labels, and tire labels.